There’s much to identify with in Frances here, a 20-something desperately trying keep a career in dance going in Manhattan, a city which chews up and spits out artists like her daily. Not only is she challenged by losing her position in her current dance company and breaking up with her boyfriend, her BFF Sophie has gotten her engaged forcing Frances to move out. Despite the unconventional nature of this picture, this the most classical kind of cinematic set-up, a near-complete upheaval life from the point of view of the film’s heroine. But Frances’ journey skirts melodrama all the way, instead coasting on the innate charm, affability and positivity of Frances/Greta. I refer to them as one, because I doubt there’s much to separate between Frances and Greta here, as the film was co-written by Ms. Gerwig herself and directed by her partner in life, Noah Baumbach. Baumbach’s camera rarely strays from Gerwig’s visage. Even when nothing is happening Gerwig’s throwaway reaction to something obsequious or a simple shrug becomes the point of the scene. Frances Ha is thus the kind of inside-out performance which made Diane Keaton inseparable from Annie Hall or say Anna Karina from Nana in Vivra sa vie . Baumbach has his pulse on the New York scene without bending into vacant hipsterism. Baumbach makes a great study of Frances’ new friends, in particular the wonderful pairing of Girls’ Adam Driver as Lev and Michael Zegan as Benji her new roommates who live the lifestyle Frances desires but fed by the wealth of their parents. Benji, though passively snobby, emerges as a warm confident to Frances and a possible romantic partner, if it weren’t for the fact she’s constantly referred to as ‘undatable’. ‘Undatable’ is used quite a bit and exemplifies the attraction of France/Greta. Her friend early on identifies her as the same age but looking older. This kind of backhanded insult would be enough to send most other indie romcom characters into fits of tears and self-loathing, but it rolls of Frances with an attractive self-effacing quality. It’s the money pressures which eventually crowd Frances, causing her to make difficult life-altering decisions. With ease and naturalism Baumbach tracks Frances’ career journey and her stormy relationship with Sophie together to form a strong narrative arc without the feeling of rigid narrative structure. We don’t notice the romcom structure because we’re so mesmerized by the infectiousness of Greta Gerwig and the allure of Baumbach’s sharp black and white photography. Which brings us back to the film’s timelessness. Though smartphones are prominent in the storytelling Frances could easily have stepped out the 70’s or the 1980’s. Baumbach’s prominent use of David Bowie’s Modern Love and Hot Chocolate’s Every One’s a Winner seem consciously anachronistic. And there’s Gerwig’s unstylish bomber jacket which has the same strange allure as Diane Keaton's masculine garb or Anna Karina’s demure sweaters. 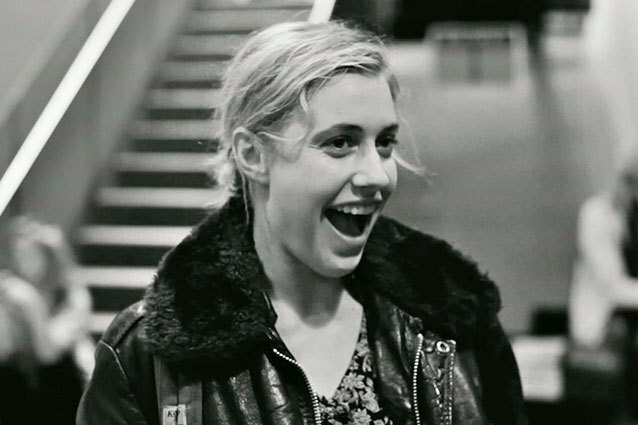 Frances Ha is confidently in the company of these other great pictures.